The House Enthusiast is ONE YEAR OLD! This is a big deal for me. Of course, I thought by now I'd be rich and famous, but eh. 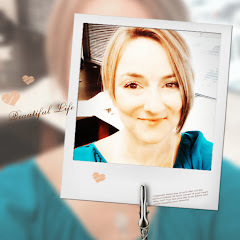 Mediocrity and obscurity works too :-) Take a look at my very first post - HAHA. 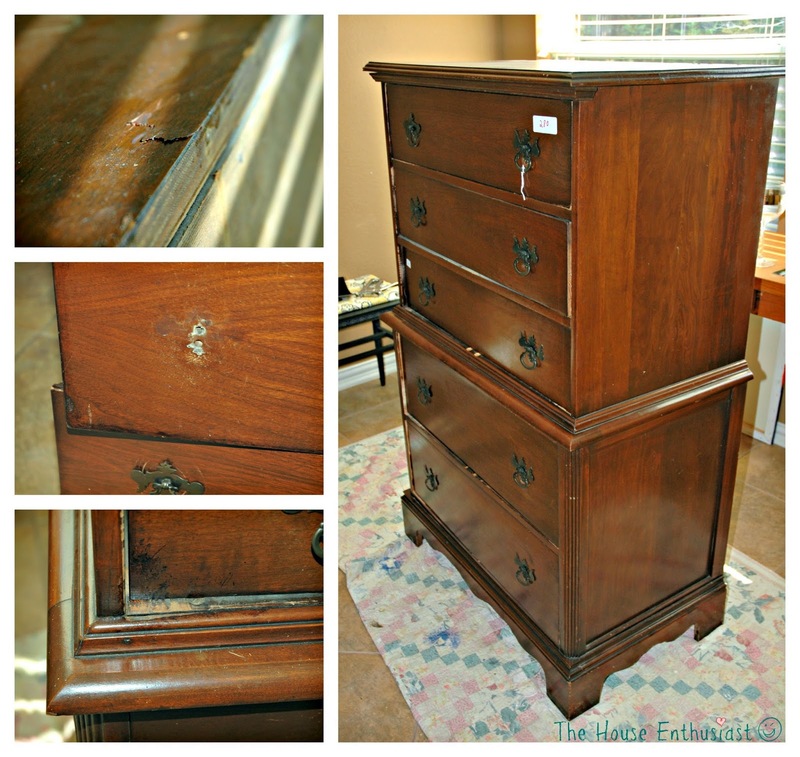 This weekend I worked on a dresser I won at auction a couple of months back. It was a little beat up, but nothing too bad and all the hardware was intact. I did my usual oh-my-gosh-I-have-to-pick-a-color mental gymnastics but I'm not having the panic attacks as much. The top laminate had popped off during the move from the auction house. Hubs glued it back on with Elmer's thinking I wouldn't notice. I noticed. However, I decided to (insert Frozen reference) "Let It Go." 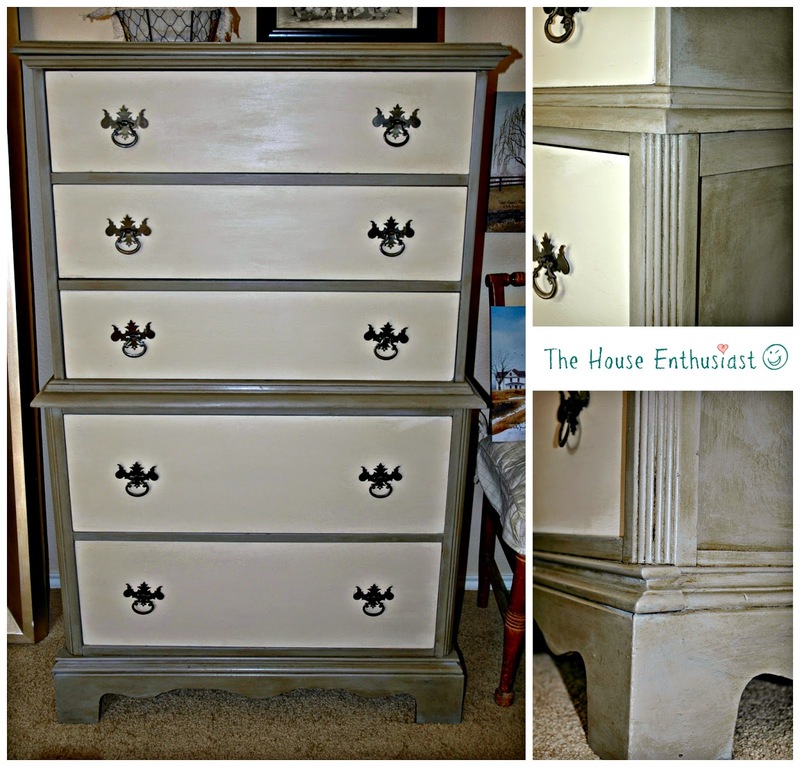 I decided to paint the body ASCP French Linen and the drawer faces Old Ocre. 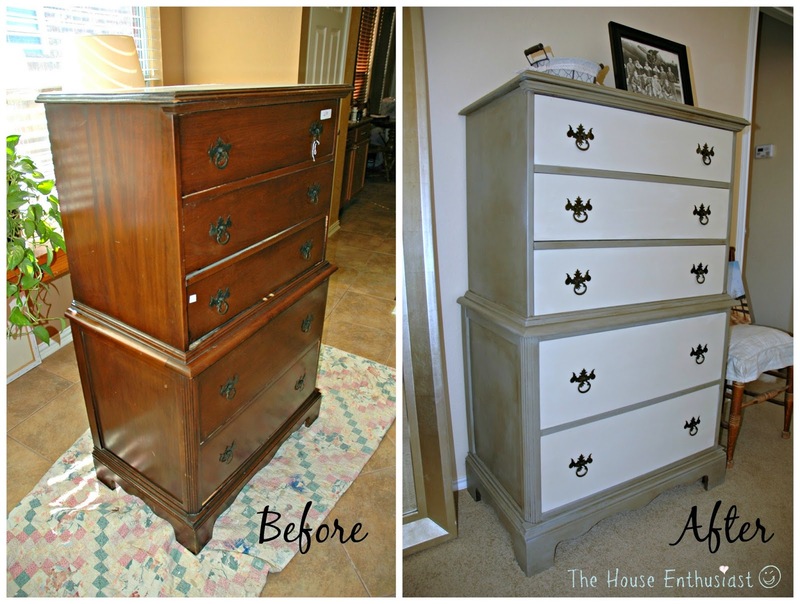 Since there is no prep work involved with chalk paint, I pulled out the drawers, took off the hardware, made sure I wasn't wearing anything NEW and started painting. 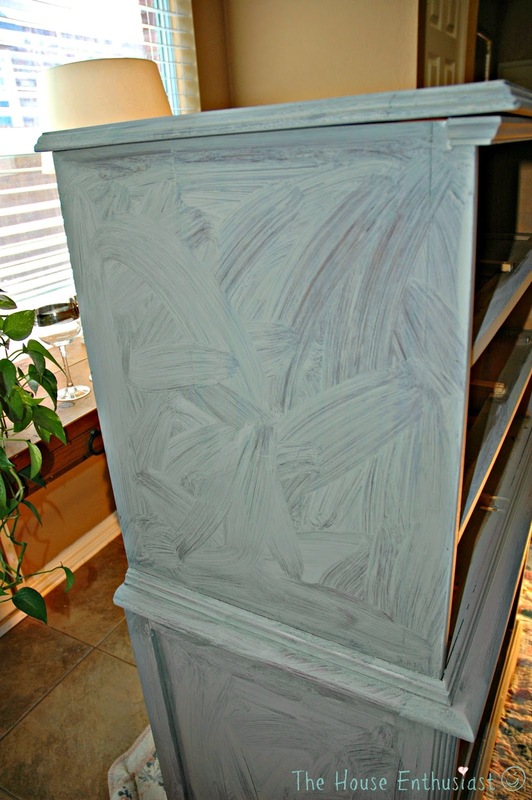 In the past, I was always concerned with coverage and brush strokes with my first coat. This time I decided to actually do what Annie Sloan suggests and just "get on with it!". Here is what the first coat looked like. I know, it looks wrong to me too. But just wait. This took me almost no time to paint and it turns out great! 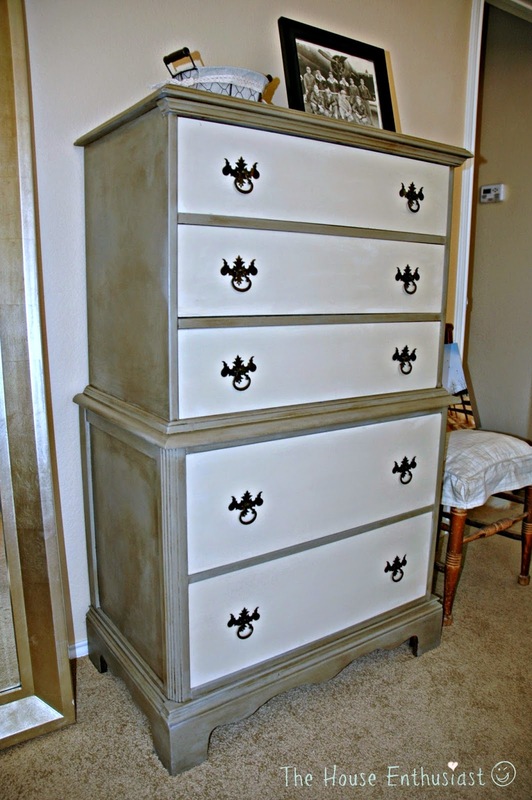 I painted the drawers the same way with Old Ocre. After the second coat, I put a coat of clear wax over everything. I use Annie Sloan's brush, but you could use a regular one. You could even hand rub it. I painted it on and rubbed it off with an absorbent cloth. You don't want any build-up. I didn't do any distressing. I finished up by buffing everything. 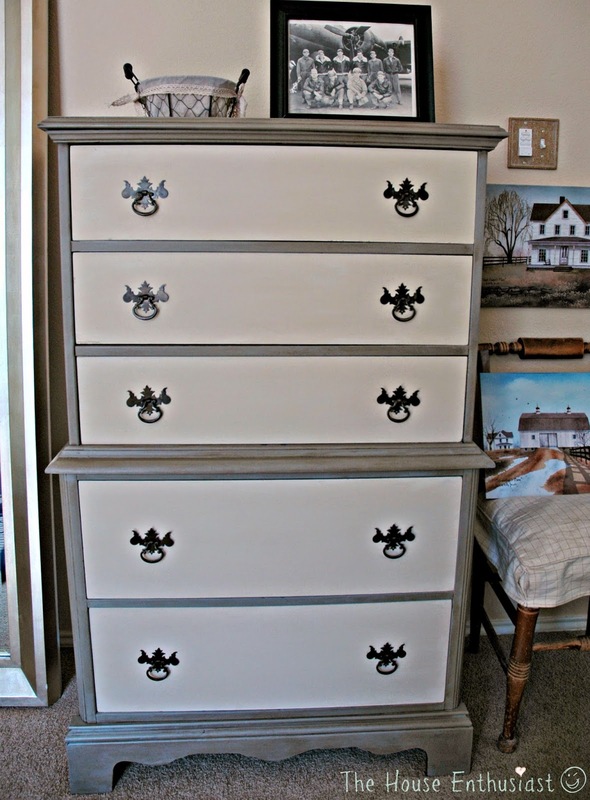 I was going to spray paint the drawer pulls black, but decided that it would be too dark and they looked fabulous the way they were!